I have a confession to make: I’ve never played the original Psychonauts. I’m a big fan of the work of Tim Schafer and Double Fine based on their more recent endeavours, but Psychonauts is a game that never really crossed my radar until recently, and I haven’t had a chance to revisit what is, to many, an iconic piece of the PlayStation 2 library. 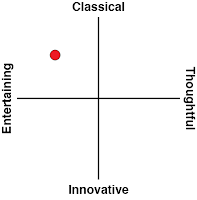 That makes reviewing Psychonauts and the Rhombus of Ruin a bit of an odd task, because it’s a game squarely aimed at franchise fans, almost to the exclusion of everyone else. It’s a brief epilogue of sorts to the original Psychonauts, and assumes player familiarity with the story therein. The plot is simple enough to follow even without that knowledge, but all the impactful, meaningful moments are tied to the expectation that players have a pre-existing relationship with these characters. The premise is simple: as Raz, freshly minted member of an organisation of crime-fighting psychics called Psychonauts, you have to locate and rescue said organisation’s leader, Truman Zanotto, who’s been kidnapped. That journey takes you (and a few other Psychonauts) to the Rhombus of Ruin, an area of the ocean responsible for the strange disappearances of ships, planes, and all manner of other vehicles. (It’s the Bermuda Triangle, essentially. Except, well, a rhombus rather than a triangle.) Of course, it’s not as simple as just waltzing in and collecting Truman, and walking out again. Things go wrong, and you end up having to save not just the leader but the whole Psychonaut gang. Saving them involves what is essentially a VR spin on a point-and-click adventure game. You work your way through a series of environments, exploring and piecing together information to solve puzzles. 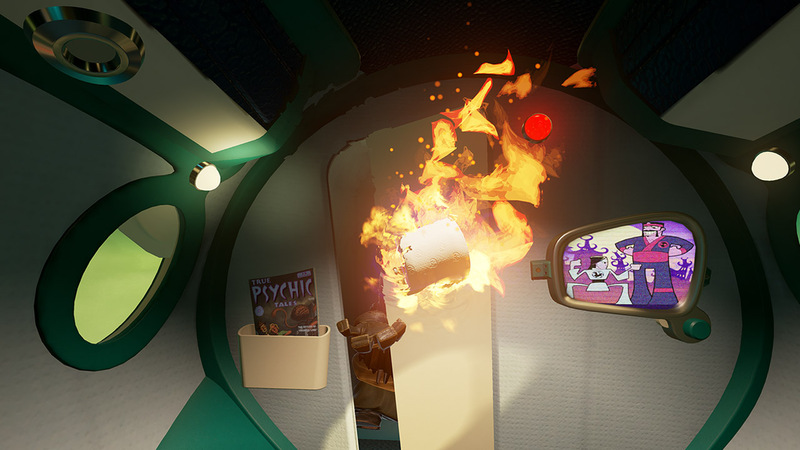 The gimmick here is that you have psychic powers, so rather than exploring yourself, you do so by jumping into the minds of other characters, each of whom has a unique perspective on the room and lets you see things others don’t. For example, the first puzzle area tasks you with finding where it is that Truman’s being held captive. That starts with using an heirloom to psychically hack into his brain, allowing you to see the world through his eyes. From there, you can jump to any of the minions within his field of view, letting you see what that grunt sees and giving you new targets for a psychic link that you couldn’t see from Truman’s perspective. Thus, the game unfolds in hopping from minion to minion, gathering enough information to find out what this place is and where it might be found. That’s an elegant solution to one of the big problems still facing VR: motion sickness. Being able to freely walk around within a VR gamespace while moving your real-life head is cause for motion sickness in a lot of people, and the most common solution is to limit movement to teleporting around. You look at the location you want to travel to, press a button, and then you blink over there; when you’re there, you can freely look around, but you can’t move your character aside from pre-defined teleportation targets. In most cases, this resolves the issue of motion sickness, but it comes at the cost of the immersion that’s VR’s selling point. Functionally, Psychonauts in the Rhombus of Ruin does the exact same thing, but it gives the teleports and lack of ambulatory freedom a narrative context that enhances immersion rather than killing it. On the other hand, Rhombus of Ruin really underutilises virtual reality in every other way, to the point that it almost feels like it shouldn’t be a VR game. The biggest issue here is that there are heavy limitations on how much you can look around. As far as I can tell, there’s roughly 120 degrees or so, vertically and horizontally, of viewable area from any given character’s perspective; turn your head more than that, and you get an “outside of play area” error. This isn’t an issue with the PSVR or my setup. I’ve played plenty of other games with full 360 degree head motion, and never had any tracking issues, but as soon as I look too far to one side in Rhombus of Ruin, I get that warning. It’s not a system error, either, but part of the game’s UI, further confirming that it’s a problem with the game itself. The other issue is that the game doesn’t really let you engage with it on any sort of VR level. Good VR games combine view, mechanics, and control setups to really create that sense of being inside the game, whether that’s something as gimmicky as Batman Arkham VR’s motion-controlled batarang throwing or something as simple as the way Pinball FX VR captures the importance of perspective in a pinball game. 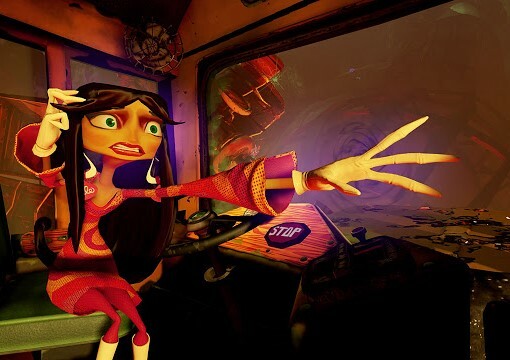 Psychonauts in the Rhombus of Ruin does nothing of the sort – it’s a very typical point-and-click adventure game, but with the pointing done using your head rather than a cursor. I spent most of my time with the game wishing I could just play it in good old-fashioned 2D, which is never a good sign for a VR game. 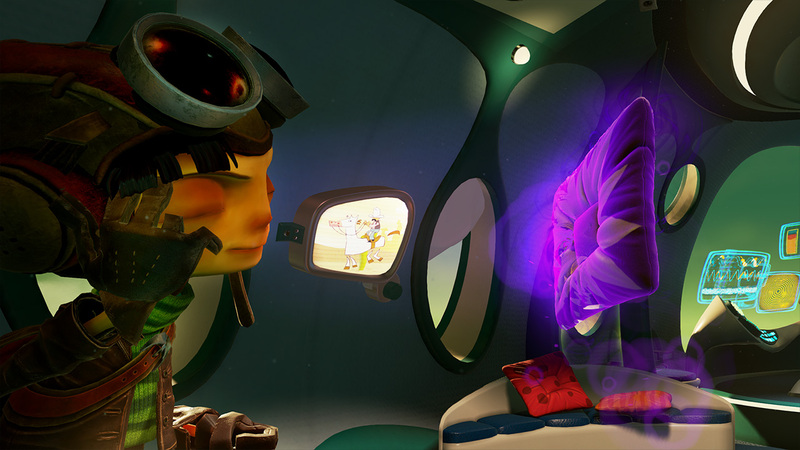 That’s a shame, because there’s a lot of potential in the Psychonauts universe for a fantastic VR game – this much is apparent even to me, despite having never played the original game. The quirky characters and outlandish locations are just begging to be explored with the kind of immersiveness that VR offers, but Rhombus of Ruin isn’t that game. 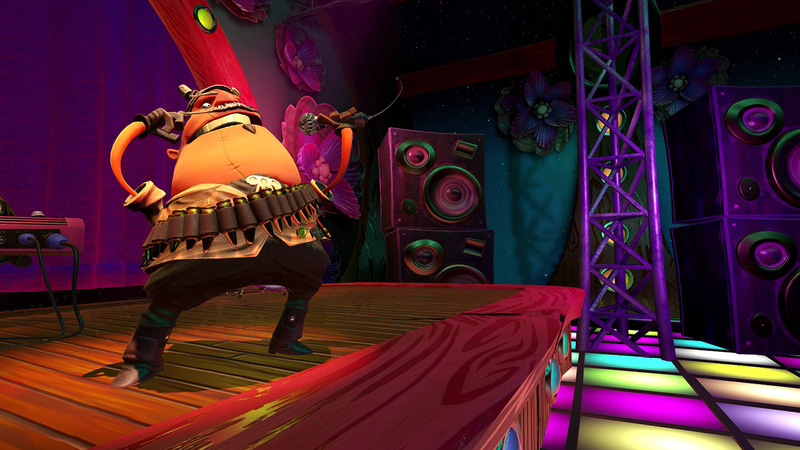 If anything, it’s a game that makes me want to finally check out Psychonauts itself, but that’s due as much to what this game fails to deliver as to what it succeeds in.